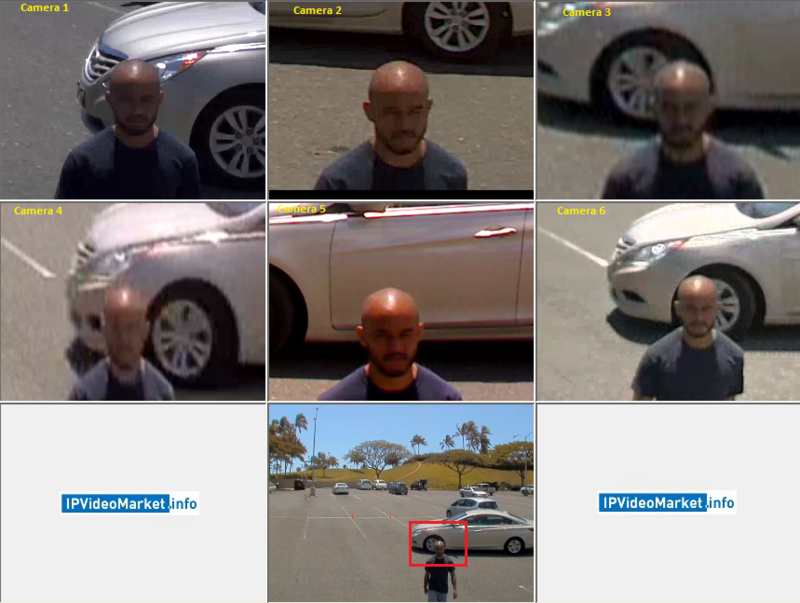 Parking lots are one of the most important areas for using surveillance cameras. Thefts, assaults, vandalism, loitering and accidents are among the many common incidents that cameras can help solve or stop. However, parking lots are particularly challenging to deploy. Cameras need to cover large areas over a variety of lighting conditions and are often costly to integrate. In the last few years, parking lot surveillance options have increased with the proliferation of multi-megapixel cameras. However, what benefits do they provide and what can users realistically expect? For each scenario, inside the Pro section, we share a full video export and a screenshot comparison along with our analysis and ranking of the camera's relative performance. The primary intent of these results is for integrators and users to see how surveillance video will look in real world scenarios that they commonly use. 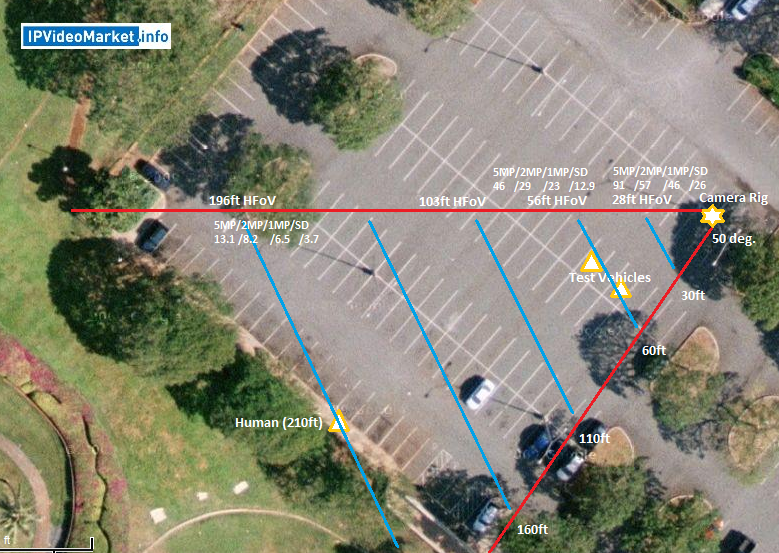 For instance, if you want to cover a parking lot with a fixed camera, this report will show you wide and far you can realistically capture a face or a license plate. To help you see the tradeoffs, we have picked different categories of cameras (by levels of resolution and day/night support) so you can anticipate the value of choosing one product tier vs another (e.g., color vs day/night or 720p vs 5MP, etc.). Since substantial price differences exist between each category, this can help you determine whether or not a premium tier is 'worth it' in this specific application. While we disclose the models and manufacturers use, it is not our intent to show that one manufacturer is better than another. Indeed, we have a strict policy forbidding manufacturers to use our results as a testimonial or endorsement for their products. Products are choosen to be representatives of categories (e.g. 2MP color only or 5MP D/N). The model numbers (and settings used) are disclosed so readers can check for themselves and better understand any issues or tradeoffs in how we conducted our tests. First, and most importantly, we recommend you look at the screenshots and watch the video exports. You really need to see for yourself to appreciate the performance delivered. The practical benefits of megapixel were more significant closer to the camera (making out details of faces, license plates and cars). While the megapixel cameras generally provided a better image at further distances, the pratical benefits were minimal as the objects captured were 'blob' like, lacking in detail. Glare and low light (even with street lighting) significantly reduced and, in some cases, eliminated the quality benefits of megapixel over SD. The Sony performed strongest in high lighting variance scenes (glare and shadow) but relatively poorly in even lighting scenes. Our theory is that Sony's superior WDR capabilities moderately reduces its ability to provide details in 'ideal' scenes. The 2MP color camera from IQinVision repeatedly provided the most details during the day and the least during the night. Capturing license plates on cars with their lights on was very difficult with default settings (regardless of the resolution). In this scenario, cameras are digitally zoomed into subjects ~210ft out where the horizontal FoV (HFoV) is ~196ft. Two human subjects and one vehicle are the focus of the analysis. Note that lighting is even and not particularly challenging. The 2MP color-only (IQ042S) provides the highest level of detail at this range and lighting conditions. The 5MP shows slightly less detail and is also a bit under-exposed. At this wide HFoV (~196ft) the 2MP yields ~8 pixels/ft for the subjects within this scene while the 5MP (Axis P1347) yields roughly 13 pixels/ft, yet a slight edge still goes to the 2MP (IQ042S) in this scenario. In the SD (Bosch NBN-498) the human subject changing clothes by the SUV is barely distinguishable from the SUV itself. In this scenario cameras are digitally zoomed onto a human subject roughly 35ft out where the HFoV is ~33ft. The lighting is even, and not particularly challenging. The 2MP color-only (IQ042SI) provides the greatest level of detail on our human subject. The picture is noticeably crisp and the identity of the subject can be determined with high certainty. The 5MP D/N, offers the next best level of subject details, but is slightly under-exposed and has diminished contrast in the subject's facial details. The 720p D/N (Sony CH140) and 720p D/N (Axis P1344) are similar to each other given that they both provide a fair degree of facial details. In the SD D/N (Bosch NBN-498) subject details are not very strong and the subject looks blurry. In this scene, cameras are digitally zoomed into a human subject ~130ft out, with a HFoV of ~121ft. Direct sunlight (~40K lux) into the cameras pose a considerable lighting challenge. In the 2MP color-only snapshot the human subject is easily distinguished amongst the surrounding vehicles. In stark contrast, the SD D/N and the 720p D/N (Axis P1344) are so limited in details that the human subject is not even detectable in their snapshots. The other 720p D/N (Sony CH140) and the 5MP D/N offer less details compared to the 2MP color-only camera, however, an ability to detect the human subject amongst the vehicles is possible. Note that the 5MP D/N struggles to produce contrast and is quite under-exposed. In this scene, cameras are digitally zoomed into a human subject ~30ft out, with a HFoV of ~28ft. Direct sunlight into the cameras poses a substantial lighting challenge. The 2MP color-only (IQ042SI) clearly shows the greatest level of details on the human subject. In this snapshot the identity of the individual can be arrived at with high certainty. The 5MP D/N, despite having roughly 2X the number of pixels/ft. at its disposal provides considerably less details on the subject than the 2MP color-only. Indeed, the 5MP seems to struggle with contrast and exposure levels in this harsh lighting environment. In this scene, cameras are digitally zoomed into a human subject ~130ft out, with a HFoV of ~121ft. The cloud cover (overcast) softens the harshness of the sunlight and dims the ambient lighting level to a degree. In comparison to the harshly lit scene earlier, this overcast scene produces a 'friendlier' lighting environment. As a result, many of the negative lighting effects have diminished or have been eliminated throughout the composite, and now the human subject is detectable in all cameras. The 2MP color-only provides the most details. The 720p D/N (Axis P1344) exhibits some color distortion or oversaturation in the picture. The 5MP produces a fairly crisp image, but shows lesser contrast and is somewhat under-exposed as well. In this scene, cameras are digitally zoomed into a human subject ~30ft out, with a corresponding HFoV of ~28ft. Cloud cover softens the harshness of the otherwise direct sunlight into the cameras. In contrast to the harsh sunlight test (near subject), this overcast scenario produces cleaner images overall. The 2MP color-only (IQ042SI) produces the most detailed image with hardly any noticeable artifacts. Suprisingly, the 5MP D/N (Axis P1347) slightly underperforms some 720p D/Ns despite offering nearly twice the number of pixels/ft. (91 pixels/ft to 46 pixels/ft). In this scene, cameras are zoomed into a human subject ~200ft out, with a HFoV of ~187ft. In this nighttime shot, roughly 5 lux of illumination is provided by artificial lighting in the parking lot. Note that the 2MP (IQ042SI) camera is color-only so no switching to BW is possible. The 2MP color-only (IQ042SI) stands apart with its inability to produce any kind of useful video here. Interestingly, the rest of the field are hardly distinguishable from each other despite their differing specifications. Perhaps, it can be argued that the 5MP D/N (Axis P1347) exhibits the least noise in this particular 'shot', but overall there are no 'real' benefits. Also, the SD D/N (Bosch NBN-498) clearly exhibits the least amount of detail, but is really no less effective in practical terms to the other higher resolution cameras. In this scene, cameras are digitally zoomed into a human subject ~30ft out, with a HFoV of ~28ft. In this nighttime scene ~10 lux of illumination is provided by the surrounding artificial lights. Note that the 2MP (IQ042SI) camera is color-only so no switching to BW is possible. The 720p D/N (Axis P1344) provides the best level of detail in this scene. It is clearly sharper than any other snapshot as evidenced by the texture of the subject's clothing being brought out. Surprisingly, at this narrow HFoV the 5MP D/N (Axis P1347) performs inferiorly compared to the other lower resolution D/Ns, despite having ~91 pixels/ft. at its disposal. Moreover, the SD D/N (Bosch NBN-498) with only ~26 pixels/ft appears better than the 5MP D/N. In this scene, cameras are digitally zoomed into a vehicle subject ~90ft out, with a HFoV of ~84ft. Lighting conditions are even and present no 'real' challenges. The focus of the analysis is on the vehicle and its interior (e.g., driver and passenger details). Snapshots of the 2MP color-only (IQ042SI) and 720p D/N (Axis P1344) reveal the greatest detail of the car's driver and interior. Note also that these two cameras provided the truest color rendition (gold rather than silver). Remarkably, the two cameras allow us to see through (both rear passenger and driver side windows) to the other side of the vehicle's exterior. The 5MP D/N (Axis P1347) also performs moderately strong, as we can peer through both windows to the other side, but a lack of contours on the driver's head and a less than true color representation make it slightly less competitive against the two front-runners. In this scene, cameras are digitally zoomed into a vehicle subject ~35ft out, with a HFoV of ~33ft. Lighting conditions are even and present no 'real' challenges. The focus of the analysis is on the vehicle and its interior (e.g., driver and passenger details). The 2MP color-only (IQ042SI) provides the highest level of details of the vehicle's driver and interior. The darker interior of the vehicle is sufficiently illuminated to determine with a high level of certainty the number of passengers present (or not present). While the 5MP D/N (Axis P1347), 720p D/N (Sony CH140) and 720p D/N (Axis P1344) provide a fair amount of details of the driver and interior, as well, overall performance is not as strong as the 2MP color-only camera. For instance, the 5MP D/N (Axis P1347) is a bit under-exposed in the interior regions of the vehicle. In this scene, cameras are digitally zoomed into a vehicle's license plate ~42ft out, with a corresponding HFoV of ~39ft. The focus of this analysis is on the ability to read license plates while the tail-lights are on. Overall, severe blooming from the tail-lights is observed in all the camera's except for the 720p D/N (Sony CH140) and 2MP color-only (IQ042SI). The 5MP D/N (Axis P1347) exhibits particularly extreme levels of blooming, where the presence of a vehicle is hardly detectable. The two cameras that exhibit better control of the blooming effect, however, are still unable to provide enough details on the license plate for capture. In this scene, cameras are digitally zoomed into a vehicle's license plate ~42ft out, with a corresponding HFoV of ~39ft. The focus of this analysis is on the ability to read license plates while the tail-lights are off. Note that lighting fixtures provide roughly 5 lux of illumination. The 5MP D/N (Axis P1347) is clearly providing the best level of detail of the license plate, while the 720p D/N (Sony CH140) is next best in terms of details. However, in both cameras the plates cannot be ascertained with absolute certainty, but a fairly good 'guess' can be made, especially in the 5MP D/N (Axis P1347). In contrast, the remaining four cameras do not allow a reasonable 'guess' as to the license plate's characters. Each of the six cameras were simultaneously recorded to an Exacqvision VMS during four (4) key lighting scenarios. All cameras are set to their defaults during test scenarios. Throughout each lighting scenario, both a vehicle (Hyundai Sonata - Gold) and human subject move throughout the scene in a choreographed and pre-determined pattern. The human subject starts from a position far from the cameras (~210ft) and progresses in a mostly straight line towards the cameras (to within ~30ft). 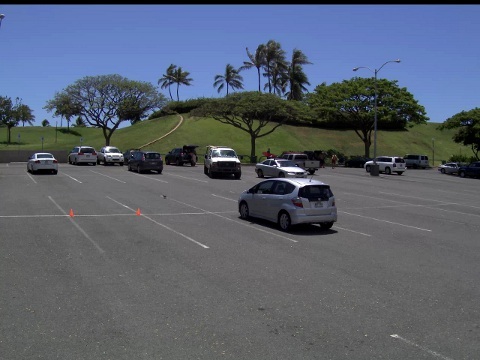 The vehicle begins a pattern relatively far from the cameras (~90ft) and drives in a loop throughout the parking lot towards the cameras. The vehicle then parks in a stall with the rear of the vehicle directly facing the cameras (~42ft). Another vehicle (Honda Fit - Silver) that remains stationary throughout the filming is parked two stalls over from the 'driven' vehicle (~50ft).